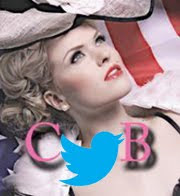 SAN JUAN, Puerto Rico -- A beauty queen who was dethroned as Puerto Rico's representative at this year's Miss Universe contest after organizers accused her of having an attitude problem is taking her fight to court. Kristhielee Caride filed a $3 million lawsuit Thursday in which she demands the return of her crown and the multiple gifts she won, including a car, plastic surgery and a seven-day cruise. 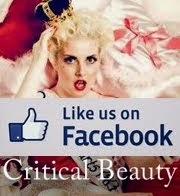 She was stripped of her title nearly a month ago. The lawsuit alleges breach of contract and contractual damages. 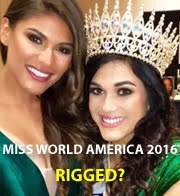 It was filed against PR Crown Entertainment and officials including Desiree Lowry, national director of Miss Universe Puerto Rico. Lowry's attorney, former Puerto Rico Justice Secretary Antonio Sagardia, told The Associated Press that he declined to meet with Caride's attorneys at their request. "There's nothing to talk about," he said. "Our decision is final." Caride's attorney, Ernie Caban, did not return a call for comment. Caride was stripped of her title after she was criticized for being dismissive and saying she did not love cameras in an interview with a local newspaper. "That's like an athlete saying, 'I don't like to train,'" Sagardia said. Lowry told reporters at the time that Caride never apologized and said only that she was having personal issues and that such an incident would not happen again. However, Lowry said Caride then canceled other appearances because of a doctor's appointment she refused to reschedule. The lawsuit says Caride underwent an unspecified surgical intervention in late February and needed to rest for a month. It said she then made a required public appearance and did not wear unspecified, required post-operation accessories on Lowry's orders. The lawsuit also states that a friend of Caride's suffered a hemorrhage during that time and it affected her emotional state. The lawsuit says Caride was briefly hospitalized for depression after she was stripped of her title. Caride said in a Facebook post last month that beauty queens are not exempt from bad days and that she allowed her feelings to come before her job. She apologized and said she was turning over her sash even though she disagreed with the decision. 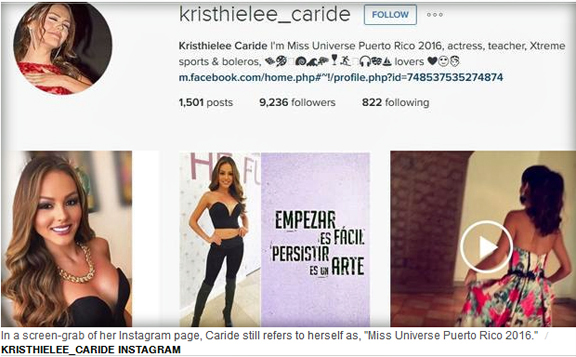 In a screen-grab of her Instagram page, Caride still refers to herself as, "Miss Universe Puerto Rico 2016."